@FrolickingFizzgig - "damn you nerds with your spreadsheets!" Shakes fist! @snufkin wrote: @FrolickingFizzgig - "damn you nerds with your spreadsheets!" Shakes fist! Fizz took "Archives of the Empire" to heart. 46. Kylo taking Rey and walking across an open battlefield was the least logical thing to do and he wasn't thinking tactically. I really hope we get more archives references in the ST. Like even if our two favorite nerds are stuck together and he starts going on about it and she'll roll her eyes with "yes you've already told me about your special access to the Imperial archives like already 100 times." I do too! As a former library archives worker during my college years, I can attest to both the nerdiness and asocial leanings of those in that line of work. It's too good a reference for Rian to pass up if the two nerds are trapped together inside an ancient Jedi temple. Quick, now make a list of things the antis predicted correctly or were right about! @Helix wrote: That really makes it sound like J.J. is writing his fanfic. That, in fact, might be the most apt way of looking at the ST: JJ and Rian's smutty Star Wars fan fiction, starring Kylo Ren as JJ' s self-insert and Rey as his #dreamwoman. Nothing beats the TFA novelization. You know, where Kylo pushed into Rey? And where "he touched her anew"? Haha, yes! And before that we get to a taste of Deep Thoughts With Kylo Ren so we see what a brooding bad boy he is. "He was content within himself". Yeah. Until he touched her anew after her "clumsy efforts to keep him out". #47 The official Lucasfilm artwork released for Star Wars Celebration on London 2016, particularly The Abduction by Erik Maell, and Call to the Light, by Brandon Kenney. These definitely don't look like pictures depicting cousins. "This girl... She must be my little cousin I hid on Jakku as a fifteen year old," said the vulnerable, conflicted warlord as he held her hips level with his manly area and gazed at her decolette. "That's right, fandom," said Lucasfilm as they gave Reywalkers the middle finger by selecting Erik's delightfully camp artwork. I would love the idea, but I think it needs it's own thread, maybe? It would be awesome. And I looooove this thread, but you guys have been so through, I can't think of anything else to add. Some things are not yet proven. 47. The main story revolves around Kylo and Rey. You forgot to add he's...uh...an Anakin fanboy who...uuuuhhhhhhh...hurt Finn and Rey! And it's certainly common for in art and literature to have a male cousin linger in the dark background, gazing longingly at his female cousin, and looking like a Byronic male protagonist. God, you Reylos are clearly projecting! @MeadowofAshes wrote: "This girl... She must be my little cousin I hid on Jakku as a fifteen year old," said the vulnerable, conflicted warlord as he held her hips level with his manly area and gazed at her decolette. I will never get over the placement of Rey's scavenger fanny pack/bum bag in that Erik Maell Abduction artwork! 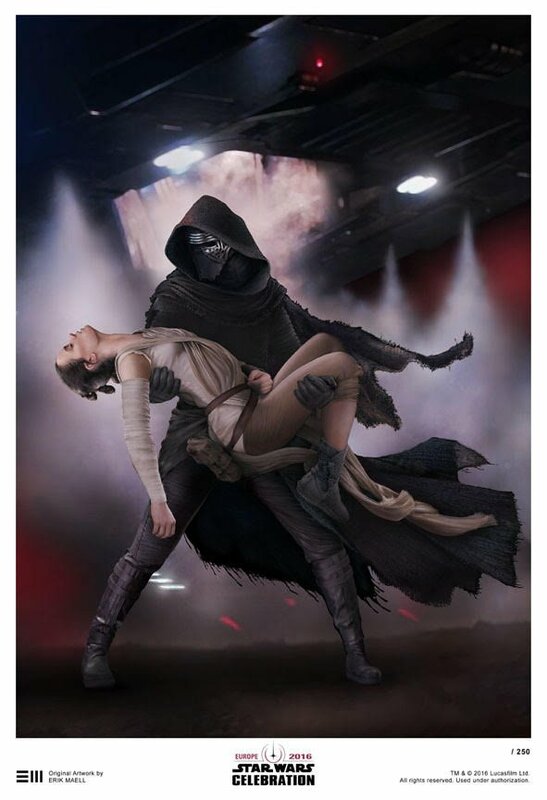 Mrs Ben Solo wrote: I will never get over the placement of Rey's scavenger fanny pack/bum bag in that Erik Maell Abduction artwork! I forgot all about that part from our original discussion when this art piece first made its debut!!! I swear to God, it's actually the first time I noticed this. I just keep thinking about how it could possibly hit him if it shifts the wrong way. Here's one that goes a bit with 'Kylo is unpopular!!'. Only white people like Kylo/Reylo.